Poet Laureate of Ansted University, Stephen Gill has authored more than twenty books, including novels, literary criticism, and collections of poems. His poetry and prose have appeared in more than five hundred publications, mostly in Canada, the United States of America and India. He writes usually in English. Once in a while, he writes poetry in Urdu, Hindi and Panjabi languages. He has also written and published book reviews, research papers on writers and on world peace. Some of his Urdu/Hindi poems have been sung with music by prominent singers of Pakistan and India. Stephen Gill has received awards and recognitions, including three honorary doctorates; and Laureate Man of Letters from United Poets Laureate International; Sahir Award of Honor from Sahir Cultural Society, Panjab, India; Plaque from the World Council of Asian Churches (Canada); Pegasus International Poetry for Peace Award (Poetry in the Arts, Inc., Texas,); The Best Poet of Peace Award for the year 1993 from Roger Cable 11 (Canada); and The Queen’s Golden Jubilee Medal. He has been asked several times by several organizations to judge their poetry competitions, and he often evaluates dissertations of English Literature for doctoral students of universities in India. He is a focus of doctoral research by scholars. He is a freelance government approved interpreter for Urdu and Panjabi languages. He is also honorary editor/ advisor to several publications, and has edited publications, including the Canadian section of the World Federalist newspaper, Writer’s Lifeline, and South Asian Christian Diary. He is former president of Vesta Publications Ltd.; the Canadian Authors Association (the Cornwall, Ont. Branch); a national vice president of the World Federalists of Canada; the Multicultural Council of Stormont and Dundas; chief delegate to represent the World University for Canada; the Christian Cultural Association of South Asians, and Dean of Peace Studies at St. Simon’s College, London, England. At present, he is an honorary member of the Ansted University Board of Advisory Council, a director of the Children’s Aid Society of the United Counties of Stormont, Dundas & Glengarry (Canada); and Co-chair of Downtown Improvement Business Area (DBIA) of Cornwall. He has appeared in several prestigious national and international reference books, including Immigrants We Read About by George Bonavia, International Production, Ottawa; Who’s Who In Canadian Literature, Reference Press, Toronto, Canada; Vesta’s Who’s Who of North American Poets, Vesta, Canada; Ethnic & Native Canadian Literature: A Bibliography by John Miska, University of Toronto Press; Something About The Author, vol. 63, Gale Research, USA; Who’s Who In Canada, Toronto University Press; and Who’s Who in Ontario, Heritage Press, B.C., Canada. Here we are presenting STEPHEN GILL'S autobiographical account based on his visit to India in the shape of beautiful article. Normally, I forget numbers, especially years and dates. In spite of this weakness and a lapse of substantial time, the year 1999 is secure in the locker of my memory. One reason for its security is Shrine that was released by World University Press in 1999. Even in 2008, after nine years, Shrine resurrects traumatic feelings, touching the spots of deep pain from the days of the partition of India. This collection of my poems of social concerns is the turning point in my pilgrimage as a poet, because it received encouraging reviews and is still receiving encouraging. The year 1999 is unforgettable to me for this reason and also because the poems of this collection have appeared in more than one hundred publications and several have been translated in other languages,. In 1999 the BJP (the Bhartiya Janata Party) was in power in India. The BJP is the political wing of the RSS (Rashtriya Sewek Sangh). The RSS is the ideological parent of the BJP, the Bajrang Dal and a host of other organizations. It runs along the lines of the Nazi Party of Germany and is based on almost the same gospel. I was invited by the Indian Association For Canadian Studies to present a paper on “Canadian Blueprint for Peace” at Himachal Prades University in Shimla. I was also invited by the Sahir Academy to receive an honour. Other invitations included a talk at the Meerut University; Khalsa College in New Delhi; an interview on Jalandhar Radio Station; and tea with a prominent writer, Dr. Shiela Gujral, wife of a former prime minister of India. I suspected something wrong with the Indian Embassy in Ottawa when it kept silence for issuing a visa to me. To break this odd silence, I kept reminding the embassy through the office of my local Canadian parliamentarian. Before issuing the visa, a gentleman from the embassy phoned to tell me that I should visit only those places where I was invited and should not give talks in churches. I found both these warnings unusual. They were unusual because I have never been active with religious groups and normally I am not invited by them. They were unusual also because my movements were restricted in the country of my birth without any reason. These warnings sounded as if I was not allowed to attend even a Sunday Service in any church. Delay, warning and the ideology of the BJP were sufficient to alert me. I applied also for a visa to visit Pakistan. The Pakistan Embassy issued me a visa promptly, though I did not mention any special reason for my visit and in spite of the fact that I have written a number of articles against the discriminatory policies and laws of that land. I planned to go to Pakistan badly because I wanted to collect material for a book. Yet, I did not go because of my weird experiences in India. My experience at the Jalandhar Radio Station was really weird. The interview was arranged and conducted by Mr. Joseph Freddy, chief editor of Masihi Sansar, a publication from Jalandhar.The title of the Panjabi poem that I was going to present can be translated as “If We Were Free.” I was asked more than once by the person who was recording the interview to make the title of the poem clear. I told him that the poem is an explanation by itself. There has to be something left for the reader to imagine and think. He objected to the poem though the title suggested freedom from futile traditions and superstitions. The interview was interrupted several times by the same person to let me know that I could not say what I was saying, though I said nothing against or in favor of the BJP, ruling party, extremists or any creed. After three or four interruptions, that person took the matter to the head of the Radio Station. He first offered us tea and then told me that they would prepare a list of questions for me to answer in writing. On their approval, I will be asked to read out those answers. I told them that would be a mockery of the interview. I had presented my poems at the same radio station in my previous visits and was interviewed without problems. For the first time, I realized the value of a poet. Nobody cares for poets in Canada. A poet is free to say whatever he or she likes. But in India, a radio station was afraid of a poem that neither attacked anyone nor used obscene words. I felt as if I were surrounded by police or military and my activities were watched closely. There were moments when I had felt like walking out of the interview. On my assurance that I would answer those questions differently, we were back to the interview. Somehow the session was completed. To the best of my knowledge, the interview was never aired. Later, the same poem in Urdu/Hindi version, was sung to music by Mr. Shad, a prominent singer from Pakistan. Another weird incident took place at Khalsa College in New Delhi where I presented my views on a democratically elected world government. The audience that consisted mostly of the college teachers was receptive. I was honoured with a garland and a bouquet. It was decided that questions would be asked after the tea break. Soon after the break, a person came and started putting my books, that I had displayed on a table, into my briefcase, saying that the second session would not be held and the car that brought me was ready to take me back. The principal of the college was extremely polite to say thanks, asking me to come again. I was almost forced to run from Khalsa College. It was abnormal. My books were not even packed properly in my brief case. When I came out, the same car was ready to pick me up, and in no time I was out of the campus. Why this hurry? Why was the second session postponed? Who was at the back of all this? Such questions still linger in my mind. Among other experiences I would like to add my invitation by the Indian Association of Canadian Studies. This organization was going to have an international conference at Himachal Prades University in Shimla. Shimla, at an altitude of 6988 ft (2130 meters), was the summer capital of the British Raj in India. I arrived at the railway station of Kalka where, as per instructions from the conference committee, I was to board a train for Shimla. This railway line was the main, comfortable and cheap link to Shimla. It was a hot morning. At Kalka Railway Station I was flatly refused a ticket on the pretext that the seats had been booked. I went to the train, not far from there. I could see several empty seats. I knew there was a quota fixed for visitors from abroad. Moreover, there was no point in going to the conference on the last day. There was a question of my stay at an unknown place that did not appear to be friendly. I wanted badly to share my concerns with the main person at the booking office. No one seemed to be in a mood to talk to me. I was getting tired and nervous due to my travels from Canada and the dry scorching heat. After a few trials, I began to shout in rage. My shouts drew a small crowd. A man indicated to the clerk through signs to issue me a ticket. Inside the coach, I met delegates from other cities of India. I felt humiliated because of the treatment I had received at the ticket counter and relief at the same time when I found a seat. Shortly the train began to move and at times halted, before ascending the hills. It was a small railway track for a toy train that consisted of five or six coaches. From Kalka, the train moved at an average speed of thirty kilometers per hour, passing through bridges, lush green valleys and breathtaking tunnels. At times, it became fearsome when the train moved between the ravines but not that fearsome when it moved between the high walls of rocks on both sides. Volunteers of the conference received us cheerfully at the Shimla Railway Station. They took me in their wagon to a hotel. After a couple of days, I presented my paper that was chaired by Dr. Waterfalls, assistant Canadian High Commissioner in New Delhi. He congratulated me for handling the session successfully. However, a female, who did not appear to be a regular delegate, asked me weird questions that had nothing to do with my subject. I had never seen her before or after in any session or during the breaks. Back at the hotel, the management asked me to fill-up a form for the government. I was the only one from abroad in that hotel, who was attending the conference. The management told me that they had never asked their guests before to complete such forms. At Meerut University, another gathering where I was to speak, government officials came to interrogate the management of the conference when I was at the podium. The management had to step out. The president of the organization told me that he could not be present in the hall to listen to me. He told me further that they were not prepared to answer their questions because government officials usually do not enter the campus without permission and he had never been asked those types of questions before. These and other incidents that I am not mentioning here to be precise, confirm that there was Intelligence behind me. A question arises, why Intelligence after a Gandhian in the country that claims to be Gandhian? A possible answer is the tragedy that happened to an Australian medical doctor Graham Stains, who worked for thirty years to eradicate leprosy from Orissa. One night, Dr. Stains and his two sons, aged 9 and 7, slept in a wagon. A mob of about one hundred people stoned the vehicle before setting it on fire. The mob formed a ring around the vehicle to prevent helpers from coming out of their houses. When the children tried to come out of the burning wagon, they were pushed back. The bodies of Dr. Stains and his two children were reduced to ashes. It happened on the 23rd of January of 1999 in Orissa, India, and these small children were on a short visit from Australia to see their parents. The only crime of Dr. Graham Stains was that he worked zealously to eradicate leprosy from that region. What had those innocent visitors of 7 and 9 years done for which they had to be burnt alive in such a merciless way? That scene of pushing children back in the burning vehicle when they themselves were burning and crying shall remain alive in the museum of any cultured human. My heart cries when I think that how such brutes breathe in any civilized nation to commit atrocities in the name of any divine being. Dara Singh who burnt Dr. Graham Stains and his two sons alive was arrested after a year or so, and condemned to death by a court. The widow of Dr. Stains and his daughter, the only surviving child, forgave him. According to intelligence reports, he was alleged to have connections with the Bajrang Dal and supported the BJP (Bhartiya Janata Party) that ruled India in 1999. Mr. Dalip Singh, president of the BJP during those days, announced that they would make Dara Singh a national hero, because he was a fighter for the freedom of the lepers of the lower cast. The conscious of the land of Gandhi and Gautama was awakened when this horrified account appeared in the media. In Canada, I was invited for an interview onTV. The solution that I still suggest for India and for other nations was tolerance and coexistence. I emphasized that it was a lack of tolerance that led to the division of India, and the division has worsened the situation. It was again a lack of tolerance that led to the division of Pakistan and formation of Bangladesh that has also worsened the situation. India always needed tolerance that was preached by the Buddha and again by Mahatma Gandhi. India should follow these prophets of peace; otherwise, there will be further fragmentation of the land. It so happened that the high commissioner of India, alleged to be a BJP man, was also interviewed separately. He stressed that India is a tolerant society. The media edited my interview, putting my comments after the comments of the high commissioner when he said that India is a tolerant society. It gave the impression that a dialogue was going on between me and the high commissioner. This clipping from the Canadian TV must have been passed on to the Intelligence, which may have led them to be cautious of my presence in India. Whatever may be the reasons for putting Intelligence after me, the fact is that the salvation of India or any nation is not in burning children in the name of any creed. There have been incidents of bombing Hindu temples, killing more children, as well as women and other innocent lives in India. Maniac messiahs have their agenda for destruction and regression. They do not know that God is peace and peace comes through peaceful means. Under the present plight when the world is in the jaw of self-extinction, educational institutions provide the rainbow of hope. India is also the land of the University of Nalanda, where thousands of years ago, scholars frequented from far and wide. India has thirst for knowledge and adaptability that have formed the granite for its strength. The nations that own this strength survive and progress in diversity. India needs this strength today more than it needed it before. It is in the tradition of Nalanda University that Indian teachers are thirsty for knowledge. The government of India should invest more in educational institutions, particularly universities, to make them genuine centers of research. I visualize the spirit of Nalanda University resurrected in creative arts. There are compelling evidences that Nalanda University enjoyed the support of royal families. With the destruction of Nalanda Library by invaders, there began a destruction in Indian thought, including astronomy, mathematics and coexistence. There are compelling evidences that artists also enjoyed royal patronage in ancient India. Monarchies have been replaced by democracies. It is important for Indian governments at all levels to take care of artists and teachers. University teachers should be given incentives, including departmental promotions, as it is given in the USA where most of the research in literary fields is taking place and where publish or perish is a familiar precept within academic circles. Institutions of higher learning and libraries should create positions of poets and writer-in-residence. Benefits from such measures would be far more than those institutions would expect. India, where I passed my early days, is a land of astonishing contrasts. Imagine any creed and taste and its contrast is there in every form. It is a land of more than one hundred languages, including their varieties. It is a land of cultured and humble persons, and at the same time it is a land that is beset with the extreme of violence. It is a land of castles and mansions of unimaginable sophistication and also a land of most deadly engines of destruction. It is a land where tribal life still exists in certain areas where bows and arrows are used. India is a land where a majority of the population cannot read and write. It is also a land that has produced Nobel Laureates. It has produced wise people, including Buddha and Mahatma Gandhi. It is a land where Apostle Thomas came soon after the crucifixion of Christ. It is speculated that Christ had lived in India and read the local scriptures before starting his ministry. Enlightened coexistence that embodies tolerance provides the required strength to manage a nation of diversity. This is an Eastern thought that has been successfully adopted by the West. Its implementation forms the granite that gives strength to open the steel doors to peace and peace is the way to prosperity. The modern trend for globalization needs this strength. I mused in the boat of this strength when I wrote the poems of Shrine. I am musing more securely and with more confidence in the same boat when I revise Shrine after nine years. Revision is my forte. However, except for minor touches, most of the body of Shrine did not need any revision. There is no doubt that my interview in Canada regarding the burning of Dr. Stains and his two sons had impacted my visit to India and also my relations with the Indian Embassy in Canada. Before this interview, I used to receive regular communication from the Indian Embassy in Canada about important events, including information about the visits of dignitaries from India. This all stopped. What hurt me the most was the poetry readings. The Embassy invited questionable poets from other cities to read poems. On the other hand, I, who lived within a short distance, was ignored. It happened again and again. One day, the high commissioner was transferred. Yet, the situation did not improve. He was replaced by a female, another alleged to be a BJP affiliate. I sent emails to the new high commissioner to bring my grievances to her notice. Those emails were never responded to--unusual in Canada. I thought of another way to let her know about me. I sent a couple of my books to the high commissioner through a journalist, a friend of mine, who was going to see the high commissioner at the embassy. She did not even send a thank you note—again unusual in Canada. I phoned her and others without any results. I met her at two gatherings where I was introduced to her by organizers. I told the high commissioner that the organizers of poetry readings had been ignoring me, even though I lived not far from her embassy. Her answer was that I should invite her for talks to my city. Her answers were the same at both the occasions. This slim high commissioner was a social butterfly. She liked to give talks and be interviewed. She looked more like a film star than a high commissioner. It was rumored that she had divorced her husband and was in a hurry to go back to India to marry a second time. Even after she left, the embassy was not without the ghosts of the previous two high commissioners. However, my visit to India was fruitful in some ways. I was happy to be in the land where the bones of my parents and the bones of my parents’ parents were buried, and where for the first time I opened my eyes. I always forgot the Intelligence part when I met poets and writers of different generes. They have enriched my life. Normally, I make it a point wherever I go to meet other creative artists. Writers of every language and culture have the same aspirations and frustrations. I have found out that all writers belong to the same tribe. It is more true when I meet one from the land of my birth. At the conference in Shimla, I met Dr. Dominic Savio from Madurai Kamraj University who had research papers to his credit. He later evaluated my poetry for a book. I also met Professor Dr. Parameswari, head of the English Department & Comparative Literature at Madurai Kamraj University. She later wrote a research paper on my novel Immigrant that she presented at a conference at Cambridge University in England. This research paper was published widely. I met her later in Ottawa when she came for a research project. Whenever I needed information for my research, both were there to help. Another person, editor of Kafla International and president of Writers Club, Dev Bhardwaj from Chandigarh, proved a friend of lasting value. I stayed with him for a week. He and his wife were genuinely hospitable. Whenever I wanted to know anything about India through emails or over the telephone for my writings, he was there to discuss them with me. He arranged a couple of literary gatherings for me and introduced me to other literary figures of Chandigarh. During my stay in India, it became obvious to me that Dalit Literature was coming fast to limelight. Te word dalit referred to Scheduled Casts, who suffered for centuries under the yoke of cast-ridden society of India. It was coming to limelight because of the awareness due to democracy and education. During my discussion, it became clear that Dalit Literature, including poetry and novels, drew inspiration from the black literature of the United States. Dalit Literature provided and is still providing insight on the enigma of Dalit identity. I met a prolific dalit writer Jai Prakash Kardam, a Hindi novelist and poet. He has participated in a number of seminars, conferences and workshops on literature in various colleges and universities, presenting papers, poems and short stories. More than fifteen research works for M.Phils and Ph.Ds. have been completed on him and some are going on at different universities in India and abroad. 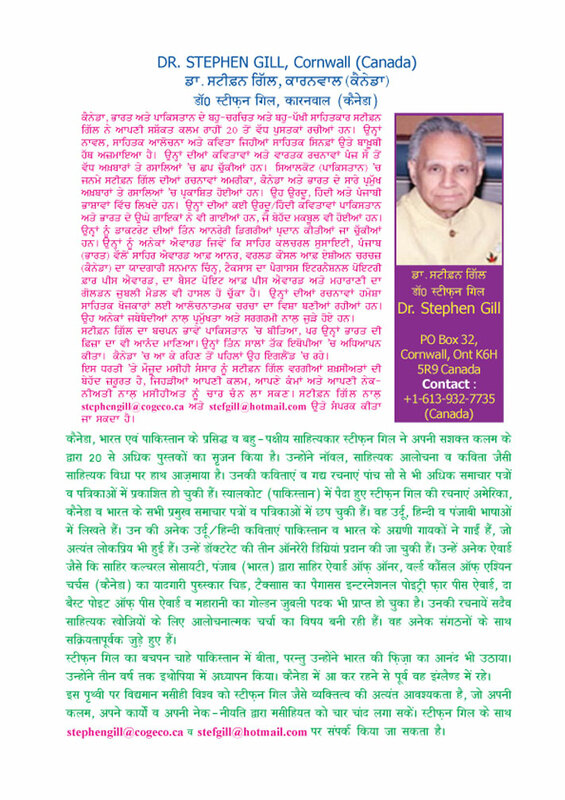 When I came back to Canada, I translated some of his Hindi poems into English. Another prolific and prominent poet and novelist is Nerrinderpal Singh and his wife Probjot Kaur from Delhi. Both are prominent poets of the Panjabi language. Nerinderpal translated my novel Immigrant into Panjabi and also published it with the cooperation of The Canada Council. In Panjabi, the novel is called Perwasi. They often included my poems in their respectable monthly By Word. Nerinderpal Singh is no longer in this world. I have mentioned the name of Joseph Freddy, editor of Masihi Sansar from Jalandhar. He was the one who interviewed me at Jalandhar Radio Station. He had a wide historical and political knowledge of India. I did not agree with everything that he held and wrote, yet we never clashed. We agreed to disagree and that formed the base of our friendship. A writer of value that I met at Shimla is Dr. Kanwar Dinesh Singh. I did not inform him of my visit, presuming he would be at the conference. He was away at his college for teaching. His mother and sister were extremely polite and hospitable. When I met him after two days, I felt my stay in Shimla and attendance at the conference became more productive. I interviewed him for an article that I lost and still feel sorry for that loss. My description would remain incomplete without mentioning the name of Dr. Shiela Gujral, an award-winning writer of Hindi, Panjabi and English. I knew her from her writings. She had invited me for tea at her place. I found her down to earth. There was no pride that came with her position and fame. I met her children and her husband, The Honourable Inder Gujral, a former Prime Minister of India. I went to see her with Romeo James, a prominent name among athletes and the sports lovers. One of the persons who made my stay in India enjoyable was Romeo James, his wife Ratna ( a daughter of my brother), and their three children, Rebecca, Romario and Rachael. His car was always there to take me from Noida to Delhi whenever I was invited by writers. Romeo was a coach of the national Indian hockey team, and later he was appointed as a selector. Before this, he was a goalkeeper. Romeo has, and still is, carving his name in the niche of golf also. He usually represents Bharat Petroleum. His son, Romario, is also becoming famous in the field of sports. He has already won national trophies.